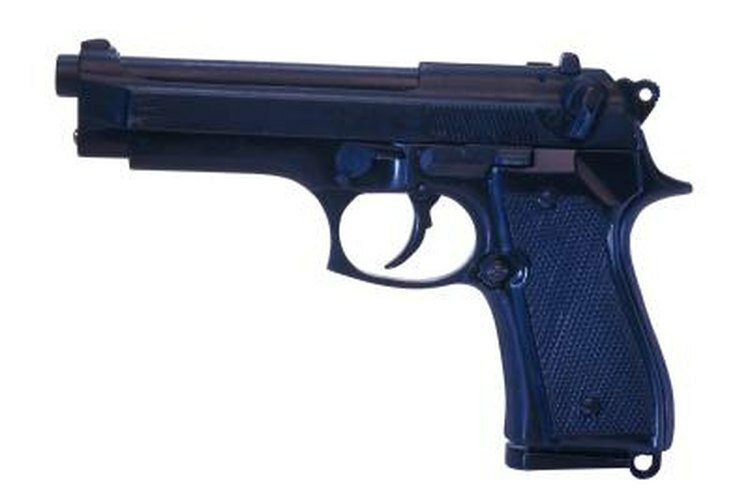 The Beretta 92FS is a popular police and military sidearm. Designed in 1975, the Beretta 92 is a popular handgun that fires the 9mm Parabellum cartridge. The 92FS is the newest model and is the civilian version of the military Beretta M9. The gun has a reputation for reliability and accuracy. Different loads and weights of bullets can impact differently, so you may need to adjust the sights for windage and elevation. Windage is the left-to-right adjustment, while elevation is the vertical adjustment. Set up a target in front of a proper backstop. Load the weapon and aim at the bullseye by sighting down the slide and aligning the front sight inside the rear sight notch. Fire five shots. Keep aiming at the bullseye between shots regardless of where the bullets impact. Determine the bullet impact points. The bullet holes will most likely be clustered. Determine which direction the group needs to move to hit the bullseye. Adjust windage by turning the adjustment screw on the side of the rear sight of your unloaded weapon. Turn the screw clockwise to move the impact point to the right. Turn the screw counterclockwise to move the impact point to the left. Adjust elevation by turning the adjustment screw on top of the rear sight. While looking down at the top of the gun, turn the screw clockwise to lower the impact point. Turn the screw counterclockwise to raise the impact point. Shoot additional five-shot groups, making adjustments until you're satisfied with the aim. Many variations of sights that have been issued with this pistol. Some are the three-dot variety, where the rear sight has two dots and the front sight has a dot that is centered between the rear dots for alignment. Other sights may have one dot on the rear and one on the front and the dots must be stacked. The methods of adjustment do not change, however. Make sure your weapon is unloaded when making adjustments. Never aim a firearm at anything you don't intend to shoot.